Updated ​for 2018. PetCube was one of the first pet cams on the market. But how does it hold up now? Find out the truth in my in depth review here. Welcome to my Petcube review. Are you wondering if the Petcube pet camera image is clear? Are you unsure if this pet wifi camera is easy to connect to your home internet? Are you without a computer and wondering if you can set up your Petcube with your cellular phone? Are you after a gps pet tracker that works outside the US? ​2018 has seen a ﻿﻿major ﻿﻿software AND hardware update with Petcube :). ​Sound and motion detection is one of the latest new features. ​Now whenever your pet camera detects motions and sounds the App will automatically send you a notification to you phone. The second newest feature is autoplay mode for the laser so you don't actually have to play the laser with your cat, it can be done via autoplay. ​These features are available with the software update both for existing owners and for new users as well. If you landed on bestpettrackers.com and you are looking to buy Petcube, click here to go straight to Amazon. It's where we recommend buying from with the best deals and free shipping available :). If you are looking for what's new in gadgets for your pets you're going to love the Petcube and how it can help you stay connected to your dogs and cats when you are not at home. But first I'm going to explain in explicit detail exactly what this pet camera does, who it's for and what people love about it and where there may be room for improvement. You can also click here and go straight to the Amazon listing if you want to check it out right now as I've found they have the best deals with free shipping options available. You'll also be able to see a lot of images so that you can easily visualise how it works and whether you and your pet will love it. ​What Stands Out About The Petcube? Who Is The Petcube Wireless Camera For? What Does The Petcube Interactive Wi-fi Camera Do? What Range Does It Cover? How Does The Petcube Wireless Camera Work? How Do You Access Your Petcube? ​What Devices Is It Compatible With? ​Are There Any Other Costs After Purchasing? ​Does The PetCube Camera Work Overseas? Can You Connect To Your Petcube With Just Your PC? ​How difficult is it to setup? ​Can you use it in Europe? ​Does the laser ever lose battery? ​Can the Petcube camera angle be adjusted? ​Does it work, say, in an outside kennel? ​Do you need a computer to setup your Petcube? ​Does your phone need to be connected to wifi to use the app? ​Can you program the pet camera to be on at certain times? ​If I view the video from my Petcube will it cause my phone data to go over the limit? ​Can you turn this wifi pet camera on remotely? ​Do you have to have wifi at home for Petcube to work? ​Can I use this on a hotel wifi? ​Is this pet camera waterproof? ​Does the Petcube have night vision? ​I only have 3 MBPS wifi at home will Petcube still work? ​Does it work on a 5ghz wifi network? ​Is the laser pointer safe for eyes? ​Can you have two Petcube cameras in the one house? ​Can you operate this pet camera on a public wifi network? ​Is the video feed secure? 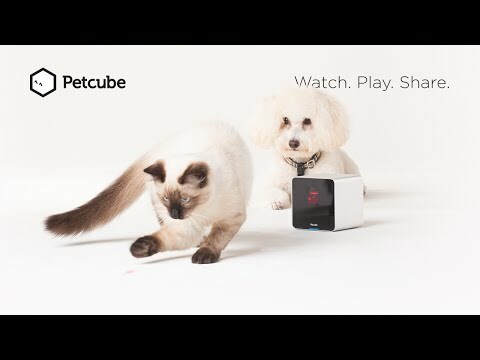 Petcube has amassed an impressive $3.8 million in total funding so far in order to create products that bring pet owners and their pets closer together.​ The first of their products is Petcube pet camera. PetCube is an interactive pet device that combines several different, convenient and fun technologies. It allows you to monitor and play with your pet while not at home, even offering verbal commands. There’s also an interactive laser pointer. By using the PetCube app, you can direct the laser to exact locations in the room to play with your pet. You can also take pictures with the camera from your smartphone. If you like the idea of having a pet camera that also allows you to give treats to your pets when you are not home and connecting with them that way then take a look at my Petzi Treat Cam review as Petcube does not have this feature at this time. ​There are quite a few reasons why you would want to connect with your pet when you're not home. Firstly, let's face it, pets hate it when their owners are away. Some pets suffer from separation anxiety and get very stressed being home alone. This provides peace of mind for both anxious pets and pet owners. Petcube changes all that with its wi-fi interconnectivity. It is one of the first products that actually allows pet owners to watch, talk to and play with their pet via their smartphone. Secondly, if you have got a pet that loves getting up to mischief when you're away, you'll love the fact that with a pet camera like this you'll be able to tell off Ralph when he starts tearing into your cushions or sofa! ​The camera is a wide-angled camera that has real time HD video so you can easily see what your pet is doing at home provided they are in viewing range. The camera is known to be very sleek and well designed. NOTE: Petcube comes with a built-in microphone and speaker. This allows you to talk to your pet via your smartphone. On a plus, given that this camera has a microphone you will also be able to hear any responses your pet makes :). It comes with a unique laser pointer which you can use to play with your pet via the SmartPhone app when you are away from home. You can use it to just exercise your pet or to create a fun game with it.​ Either way it's a very unique feature and buyers love the fact that they can play with their pets when they're away from home. Petcube has its own community which allows you to share access to your Petcube camera with friends and family members and also anyone else on the Petcube network :). When you download the Petcube app you will be able to interact with your pet at home via Petcube. Imagine being able to connect with other pets? Petcube makes that possible. The Petcube app allows you to actually watch, talk to and interact with other pets all over the world....even if you don't have your own Petcube camera yet! Many pet owners would love to keep an eye on what their pets are up to while they’re not at home. If you have an anxious pet or a pet that suffers from separation anxiety you will get a lot of benefit having something like this pet camera in your home. If you have a pet that loves destroying things around the house you will also love being able to spy on them and tell them off when they start to cause damage. Of course, that's particularly helpful if you think they will listen to you! If you leave your pet at home when you go away on vacation with a petsitter you will also benefit from being able to see how your pet is being treated while you are away and to connect with them even though you can't be there.​ Just the sound of your voice will be able to give them some comfort and you'll love being able to play with them with the laser pointer. The innovations within the pet camera with laser toy make it a solid product. This way it can offer a lot of features that pet owners are looking for, but are too expensive or complicated to use otherwise. In a nutshell, it makes life easier and more fun for pet owners. First of all, it provides a live video stream while you’re away from home. All you do is open your app on your smartphone, and you’re given access. But it does much more than that too. For one, you can give verbal commands. If your pet is misbehaving or getting into trouble, you can call their name. It’s a very effective way of communicating with them when you’re away from home. It also offers a tool to play with your pets. Through the app, you can direct a laser anywhere in the room for play time when your pets need activity. Note: As of March 2016 autoplay is now a feature of this interactive laser :). It’s a fully functional camera as well. You can take pictures and upload them anywhere you’d like once they’re stored on your phone. One of the most amazing features is your ability to play with pets. It’ll also help you to discover the behavior of your pets, and give you an opportunity to communicate with them. It’s an incredibly smart technology. By creating a network of friends, you can grant access to others and allow them to remotely use your PetCube when you’d like them to. It’s also fun to play with other people’s pets. It’s special because it offers all of these features within the one device. There are few limitations, if any. Since it can see 138 degrees around, the camera works great in wide, open rooms when placed correctly. There are other aspects as well. The play range is very large. It uses a 5mW 3R class laser which is capable of working beyond the expanse of any room in your home. Since it must always be plugged into an outlet, you may not be able to place it exactly where you’d like but an extension cord should fix that hiccup. At the same time, it isn’t limited in this way. Since you never have to replace or recharge batteries, you have unlimited life. This way you can enjoy it any time you choose and also the extra saving of never having to buy batteries for it. It connects to your home Wi-Fi. Once it’s plugged in, you press and hold a button on the back until the light on the front turns green. This allows you to establish an Internet connection. Then, all you need is a smartphone. You connect your device to Wi-Fi by using your phone via your dedicated app. You’re then given access to video streaming, other camera options, a voice command and an interactive laser pointer. It’s very simple to use. The speakers within this camera will play your voice in real time, and it’s all made easy through your smartphone. You access it through your smartphone. The only manual commands you give it are plugging it in and pressing a button. After that, you’re given complete access through a single remote device. It’s as easy as touching your smartphone screen. You select the app, and then the world is your oyster. That’s the beauty of this product – it takes all of the complication out of it so you can just have fun and peace of mind. No, it is not a waterproof camera. I mentioned smartphones. PetCube takes advantage of the two most popular and prevalent brands, which are Android and iOS. However, you must have the proper software updates. The app requires 4.0 or greater for Android, and version 7.0 or greater for iOS. Most people have these anyway, so suffice it to say that whichever model of smartphone you own, chances are that it’s compatible, as long as it’s Android or iOS. No, there aren’t. There are no further required payments for use. The app is free for users. You can even grant access to others without monthly payments or fees. It also uses your home Wi-Fi. Since it doesn’t have an Internet source of its own, you won’t have to pay for that either. It’s complete right out of the box. ​It is safe for both human and pet eyes, however, prolonged eye contact should be avoided. ​Yes it does, as long as both your smartphone and PetCube are connected to an Internet source. No, you must be using a smartphone. There are detailed instructions on how to get started with either brand, and they’re very straightforward and simple. One of the major benefits of this product is how simplified it is to pet owners, and a big part of that is due to the advent of smartphones. The pet camera itself measures 4” x 4” x 4”. There are a lot of features in one device. Many of these benefits, such as live video stream and voice commands put together make it an all-in-one device pet owners have never had before. Then there are the additional features. Being able to take pictures is a big plus. By using the app, you can capture and share moments very easily, giving you great access through one source – your smartphone. The laser pointer is a great additional benefit. It’s not all the PetCube has to offer, but it’s a big part of what makes it what it is. You get both interactivity and play from any place in the world. You never have to replace or recharge batteries, due to the plug-and-play features. It’s fun to use with a network of people. Also, the PetCube app is constantly receiving updates and being made better for its users. There is no battery option. You also must place it somewhere close enough to an outlet in order to give it power. Compatibility isn’t at a maximum. Since you either have to own an Android or an iOS smartphone, it may not be an option for some pet owners. Some people have mentioned that the laser can be inaccurate. The reason for this is that the position of the laser may shift during transportation. The solution to this is to use the calibration feature provided. Another source of confusion is starting the PetCube up. You must make sure that after you plug it in, you’re pressing and holding down the button on the back, and not the front. This PetCube review has been based on technical features so far. I’m going to give you an opportunity to read about what others have said here, in a concise fashion. First, many have found that their pets are unamused by the laser pointer. The main reason for this is that if they don’t know that the PetCube has been turned on, they may not be around to see it. This would be a concern if it wasn’t for the voice command option. There’s another aspect of timing. You never really know when your pets are up and playing, so you have to assume that when you check your app, they’re ready. Let’s end this PetCube review on a positive note. There really aren’t any other complaints, other than that customer support could be improved. Everything works beautifully. It definitely works as advertised. The camera, laser pointer and app are phenomenal examples of a company being up to date with their technology. The PetCube is a wonderful product for cat and dog owners. It offers fun, seamless options that you may have thought of on the past, but couldn’t find a product that offered all of them. Best of all, it’s effective. It’s like being in the room with your pets, even when they’re misbehaving. When I review a pet gadget obviously it's not always possible to actually buy every item and try it for myself so I spend many days researching each tech gadget in detail by going through product sites, manuals and also relying heavily on what actual buyers have said after they've tried the product for themselves. Firstly, can I say that I find the troubleshooting portion of the manual to be very extensive and informative. Much assistance can be gained by simply looking through it and it seems that things can be easily fixed. Everything is covered from the LED lights not working as they should, Wi-fi connectivity issues, what to do if the laser doesn't seem to point properly, network firewals and audio issues. Very helpfully, there is also a 24/7 support line that is toll-free within the US and Canada should any issues arise. Clearly this is a company that prides itself on being professional in its customer service delivery. What first seemed like a gimmick for some pet owners has turned into a tech gadget that is equally enjoyed by the pet owner as well as the pet. Also a lot of praise is handed down for the Petcube app which clearly is very intuitive and allows for pretty easy Petcube setup. Pet owners love being able to connect with their pets when they are away at home or on vacation...and also love being able to tell their pets to "get off the couch" or to stop destroying the apartment :). ​I very happily give the Petcube a 4 star rating and recommend it as a way of staying connected with your pet on many levels when they are home without you. I give it 4/5 stars. ​It's not difficult but if you need any help their customer service is usually readily available. ​Yes, you can, you just need the appropriate power adapter for your location. No, it doesn't, as it's operated by power. No it doesn't but it has a wide angle. ​The Petcube has been designed to point down so that you can best see your pets on the floor. ​It isn't weather or waterproof so it's not recommended in a kennel. ​No, you just need to install the app on your smartphone or tablet. No, you can use your cellular network. ​No, but if you have multiple people who want access they need to download the app and you invite those people to be able to view your live feed. No, there are no fees, just plug it in and play. ​No, the unit and the camera are always on if it's plugged in. Yes, provided you have wifi access on both your Petcube and your smartphone. ​No, the router needs to be canged to 2.4GHz transmission mode. ​It is safe for both human and pet eyes but it is recommended that you don't put the laser directly into your pet's eyes. ​No, you can't, you must have wifi via a router.